Love or Luxury Now on NOOK!! 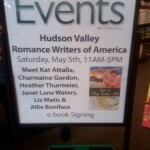 Hi everyone, I’m headed back to Barnes & Noble in West Nyack, NY on May 5th. I’ll be signing with some of my fellow RWA girls. My time slot is from 3-5. So if you’re in the Pallisades Mall area, stop by and say hello! It’s Here!! It’s Here!! LOVE ON LANDING on Nook and Kindle!